This is my forth year running /M in the Salmon Run, and it was my most ambitious effort to date. Compared to the 2012 Salmon Run the mobile platform was improved, the route was refined to be more efficient and cover more counties, and I went into this year’s Salmon Run with a LOT more experience in mobile contesting. Even with the somewhat reduced band conditions this year, the net result was more QSOs and multipliers. For the previous three Salmon Runs, my rover platform was an econobox car with the antennas hanging off a rear bracket. At some county line stops, I augmented the vehicle with a street-legal aluminum extended frame/ground plane. But the antennas were fundamentally mounted in a low, suboptimal position that lowered efficiency. In February, I purchased a 1988 Toyota pick-up truck that was, in part, intended to serve as a new rover platform. My first chance to try it out was for the Idaho QP last March. The results were terrific! For the Salmon Run the platform was pretty much the same as I used for the IDQP. I had done some additional bonding of body panels to the chassis, I added better chokes on the screwdriver control lines and rebuilt the screwdriver antennas prior to the Salmon Run. Small improvements were made in the location of the heads for the TS-480SAT and FT-857D. A capacitance hat was added to one of the screwdriver antennas. Another major change was the addition of gain antennas for 2m and 6m to the front of the truck. A week before the Salmon run was the ARRL September VHF contest. So I simply left the rotor and mast on the truck and reconfigured the antennas. A 2 element hex beam for 6m sat atop a 4 element yagi for 2m. The two screwdrivers in the back of the bed were generally used with the TS-480SAT. Hustler resonators for 40m and 75m were mounted toward the front of the bed and connected to the FT-857D. These allowed periodic checks for daytime local QSOs on the top bands. Dedicated rigs monitored 2m and 6m FM simplex frequencies (but saw little use). Bricks provided 170 watts for 2m and 6m SSB and CW. A Tascam DR-1 (upper right) recorded the entire run. I started out using a headset mic switchable between the TS480 and FT857, but RF was getting into the audio. I ended up switching to separate handheld microphones for the rigs over most of the contest. The morning began with a trip to Federal Way, WA across the street from the North Shore Golf Course. There is a safe pull-over that sits directly on the King–Pierce County line. In previous Salmon Runs, I had used locations just off of I-5 and Hwy 167. The problem with those locations is that they are in valleys (less than 140′ MSL), and the surrounding industrial areas created lots of RF noise. This Federal Way location was on a plateau at 300′ MSL and had much less RF junk around to cause interference. At 1600Z I began calling CQ on 20 meters CW. The first response came from John, N6MU, who, it turns out, would have the most QSOs and the very last QSO of the contest. After a few contacts, I switched to 15 meters CW and worked W7WA, but I wasn’t hearing a whole lot. Back on 20m, I got a small CW run going. After that dried up, I tried 20 phone and worked John, N6MU, again (first phone QSO). I tried 40m a couple of times and made a few QSOs, but couldn’t really get a run going (pretty much the daytime pattern for the weekend). I managed to work Gabor, VE7JH, on 40 CW. Gabor knew I had 6m and 2m antennas, and I knew he had them on his 6,000′ mountain top location. We quickly worked 6m phone and CW and then switched to 2m for phone and CW QSOs. In the final 10 minutes, I got a small run going on 15m CW. At 1734Z (4 minutes past my schedule departure time), I left the line with 72 QSOs (36 x 2 counties). It takes awhile to get into the groove of driving and working stations. I eased into it while en route through Pierce County, working eight stations, and eight more driving through Kitsap County. I reached the Kitsap–Mason line stop about 5 minutes behind schedule, and parked on the county line at the edge of a wrecking company parking lot. This stop was moderately productive on 20 meters and 15 meters. I “ran the modes” with VE7JH again on 6m and 2m. Driving through 35 more minutes of Mason county, I hit “the groove” of working stations while in motion, achieving almost one QSO per minute, and periodically switching between phone and CW. 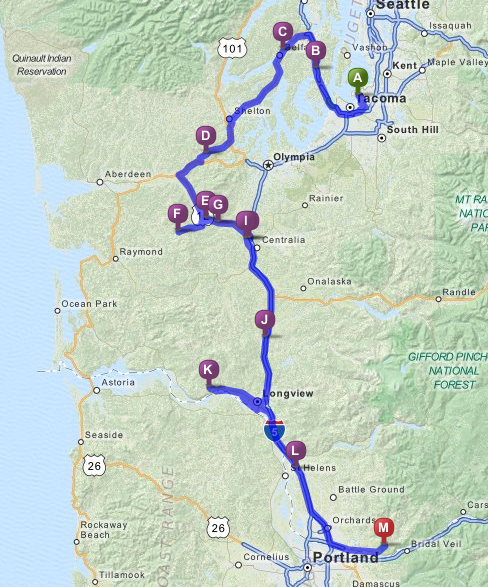 The Pacific–Grays Harbor County line was a new location for me this year. It was a pull-over along a dirt road. It was in pretty good shape. I worked a couple of runs on 20m and 15m, worked Gabor on 6m (but not 2m), and then finally got something going on 40m with a long run on phone. The next stop, on the Thurston–Lewis line was only county line stop that I had used in a past Salmon Run. It is an isolated frontage road along side I-5 with a good pull-over spot marked by a county line sign along the interstate…. This spot was quite productive on 20m and 40m, with about 100 QSOs in 90 minutes. At some point I worked N7VZU who was booming in on 40m. He reported Columbia County, typically a rare one. I hesitated for a second and asked if that was Columbia County, Oregon, which was about 45 miles due south of me. Alas, it was Columbia, Washington, some 200+ miles and one mountain range to the east of me. It was an hour trek to my next spot on the Wahkiakum–Cowlitz county line. When I got there, I wasn’t happy with the location, which was at 500′ MSL, but surrounded by terrain on three sides. So I kept driving uphill until I found this spot at 1,000′ MSL. Still, this spot was not overly productive, only generating some 30 QSOs in 90 minutes. I made some QSOs on 75m and 80m for the first time in the contest. I did briefly stop on the county line on my way out, and worked 4 more QSOs. I was only 5 minutes behind schedule as I began the 95 minute journey to the last stop for the day, on the Clark–Skamania line. The trip added 30 more QSOs to the log, primarily on 80m CW. Eighty minutes remained when I got to the new-to-me spot on the Clark–Skamania line. I worked just over 40 QSOs on the Clark-Skamania line, primarily on 80m CW, with a few 40m and two 75m QSOs thrown in. In the last minute before midnight, I worked K2DSW in Iowa on 80m CW. As it turns out, K2DSW would be my first QSO the next morning 9:00am on 20m CW, some 100+ miles east on the Yakima–Klickitat county line. A hotel room was awaiting me about 20 minutes away in Washougal, WA. The morning started out well on the Yakima—Klickitat line with 106 QSOs over the hour stay. Twenty meters was hot; 15m, not so hot. This was my only stop for a long time—the next five counties were worked in motion. Benton county only yielded 26 QSOs over 50 minutes of driving. One of the more interesting experiences was taking a 5 mile unimproved gravel road called S. Ward Gap Road on a descent through the hills over Prosser, WA. Franklin produced 17 QSOs in 40 minutes of driving, Adams gave 34 QSOs in 50 minutes, and Lincoln gave 40 QSOs in 60 minutes. The problem was that, about a mile from the county line, at the intersection of Old Coulee Road, Bagdad Road, and Rosenberg Road, progress was hindered by the fact that Old Coulee Road was closed for construction. And there was no detour information whatsoever. I pulled over and whipped out my cell phone, ready to use Google Maps to find an alternative. Alas, there was no data connection. Instead I called up my friend Dave—the person who drove for our 7QP adventure—for some alternatives. Dave suggested I head north on Rosenberg Road, turn to the West on Menke Road, and then head SW on Rosenberg Road. The plan was good, except that Rosenberg Road and Menke were unimproved gravel road. And the end of Menke and part of the second stretch of Rosenberg were bad dirt roads that descended a couple hundred feet, with sheer drop-offs on the side. I didn’t make any QSOs for this stretch of road. Fortunately, I was dumped back onto Old Coulee Road just past the end of the construction…and now in Grant County. The descent into Grand Coulee was awesome, and about half way down the winding road, I got a run going on 20m CW that forced me to stop for a few minutes. The 20 minutes in Grant County produced 16 QSOs. But I would be back in the county before the contest was over. 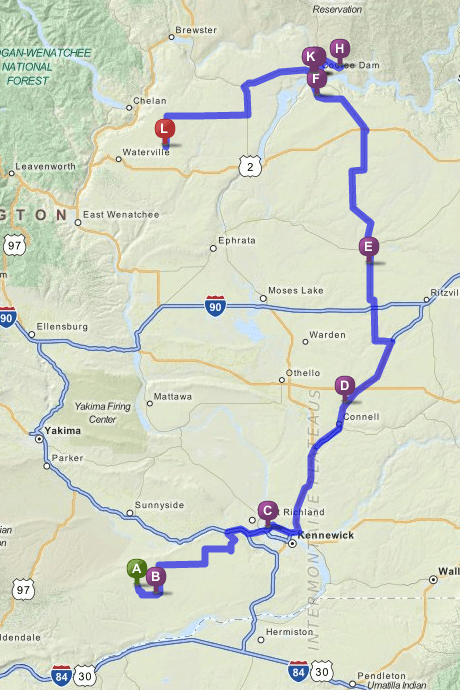 Between Grant County and Okanogan County is a 1/3 mile stretch of Douglas County. I drove through without activating the county. My aim was to reach the Okanogan—Ferry Line ASAP. I would return to Douglas County later. The 15 minute drive through Okanogan county was worth eleven more QSOs. The Ferry–Okanogan line had a good pull-over spot on the rural highway. And it was quite productive. I spent 70 minutes on the line and made something over 124 QSOs (before eliminating some dups). Most were on 20m CW, but I briefly switched to 20m phone and got a couple of small runs going on 40m CW. I left the county line with 50 minutes remaining in the contest. Google suggested it was about 25 minutes to this spot on the Douglas–Grant line. My pre-contest internet surveillance suggested that, once there, I could pull a little ways onto a dirt service road, almost underneath some high voltage transmission lines and be sitting right on the county line. I was hoping there wasn’t a fence or sign to keep away. I was also hoping there wouldn’t be too much RF noise from all the power distribution systems in the area. I arrived in 23 minutes and got positioned on the county line–just as a light rain started. I got down to business quickly to make the best of the 26 minutes remaining in the contest. I got a good run going on 40m CW for about 10 minutes before switching to Phone. With seven minutes remaining, I switched to 20m CW and worked five more stations (10 QSOs). In all, those final 26 minutes yielded 116 QSOs. It was a good run to end the contest on! It took me over a week to get all the QSOs transferred from paper and a digital recording to the computer. Then there was “de-duping”, scoring and final submission. In the end, I had 972 QSOs—775 CW and 197 Phone–and 78 multipliers. That produced 2,719 QSO points for a pre-bonus score of 212,082. The bonus for working W7DX on phone and CW, was 1,000, for a final score of 213,082. Thanks to everyone—organizers as well as folks in the log—for a Salmon Run to remember!